Perhaps I should just say first that these were gone immediately. I just consider myself very lucky that I had two friends over to help me eat them or I might have consumed the entire pan, which would have been only fleeting joy, I'm sure. So just consider yourself warned - if you keep reading, you will very likely end up with a highly tempting and addictive pan of cookie bars. I adapted these from a recipe on Our Best Bites - the link to the original post, "Peanut Butter & Jam Bars," can be found here. I know I have written of my undying love of all things involving peanut butter before. I love it in all forms, and there are many variations that I enjoy. Peanut butter with jam; peanut butter with honey; peanut butter with nutella; peanut butter with marshmallow fluff (yes, that's right); and perhaps my favorite of all, peanut butter with maple butter. So I decided, why limit myself to only one of these variations simply because it's the one in the original title? As I measured, spooned, sifted, and stirred, the delicious smell of peanut butter began to waft up at me, and I knew I couldn't. I rummaged around in my cabinet and pulled out some nutella-like chocolate spread I found in the store here, as well as a jar of special Swazi-made creamed honey. After spreading half the batter into the bottom of the pan, I spread nutella, honey, and strawberry jam on top, divided into three sections, and then covered it with the rest of the batter before sticking it in the oven. Forty minutes later, it came out of the oven looking a bit like a piece of patchwork due to the different consistencies, but smelling mouth-watering. We let it cool for as long as we could stand not to eat them, and then my friends and I each tried all three kinds. Shari and I agreed that our favorite in terms of taste was by far the peanut butter and honey, although as it cooled, it took on a somewhat caramel-like texture that wasn't as easy to eat. As for Joe, he liked the traditional PB&J variation (this is the same Joe of the recent Sweet Potato French Fries post). The nutella one had its moments, but was not heavy enough on the nutella and thus suffered in the rankings. With a little extra nutella though, the chocolate flavor would be more noticeable and I'm sure the taste would be more balanced. What is comes down to is that all three varieties were delicious, fantastic, addictive, wonderful. Need I go on? Within 15 minutes, two-thirds of the pan had disappeared, and a mere 2 hours later (after a short gorging hiatus), there was nary a crumb to be found. If you love peanut butter, this is the dessert you've been waiting for. Preheat oven to 350 F or 180 C. Spray a glass 8" x 8" baking dish with non-stick cooking spray. In a bowl, cream the margarine and sugars together. Add the peanut butter and mix well. Add the egg and vanilla and continue to beat until smooth. In a separate small bowl, combine the sorghum flour, brown rice flour, and potato starch with the xanthan gum, baking soda, baking powder, and dash of salt. Add little by little to the wet mixture, stirring very well to combine. Batter should be light and fluffy. Place spoonfuls of the batter into the bottom of the baking dish, then using a spoon or spatula, spread them so they cover the entire pan. Spread your toppings evenly onto the base in whatever proportions you prefer (if you use nutella, be sure to pile it on so the chocolate flavor will come out! ), and then drop the remaining batter on top, once again in spoonfuls to ensure even coverage. Use the spatula again to spread the batter evenly over the toppings. Place in the oven and bake for 30 - 40 minutes, or until the dough is firmly set and slightly browned. Be careful not to overcook! The edges should be a lovely brown. Remove from oven and let cool for as long as you can before devouring them. Note: The honey in mine boiled in the oven and created a sort of honey fountain over the dough, so be careful to keep an eye so that it doesn't spill over into your oven. It also became a little harder as it cooled, so you might want to eat these while still warm. These were my favorite of the three! Note: I made these in an 8x8 pan, which gives them some nice height; I'm not sure they would turn out as well spread any thinner than that, such as in a 9" x 13" pan. Being gluten-free means being a cook and a baker by default. I rarely eat any processed foods that come out of a package ready-to-eat anymore. For me, spending time in the kitchen preparing my meals in advance has become second nature, and I've since forgotten the convenience of being able to pick something off of a store shelf and eat it. I have my standard recipes that I make over and over again, partly out of convenience and habit. And I love them. But it's not that I eat these things out of sheer convenience; I happen to enjoy the tastes I've perfected in these dishes to the point where they have become default comfort meals. Being a person of routine only supports this; if I find something I love to eat for breakfast, which is also healthy, chances are I will eat it every single day without ever getting bored with it. I appreciate the consistency - and the flavor - in that. But sometimes, it can be a very good thing to leave the comfortable food arena and to experiment a little bit, even if it means just a tweak to what you've been doing. That's how this granola came about: it was a departure. As I was preparing to make my weekly batch of granola, I found that I was almost out of buckwheat flakes, and after surveying my cabinets, decided to experiment a bit with a mixture of grains and nuts that I had on hand. What resulted was a deliciously flaky and crumbly granola that packs a protein punch and is the perfect way to start the morning. Preheat the oven to 350 F. Spray a glass 8 x 8 baking dish with non-stick cooking spray and set aside. In a large bowl, combine all of the dry ingredients (everything but the honey, macadamia nut butter, and vanilla). Combine well. In a small saucepan, mix the honey, macadamia nut butter, and vanilla and heat over a medium flame, stirring frequently, until the mixture turns thin and starts to bubble. Pour the honey mixture into the bowl of dry ingredients and mix in very thoroughly. Spread the mixture into the baking dish evenly, and place in the preheated oven for 20 - 35 minutes, depending on how soft or crunchy you prefer your granola to be. Serve with soy milk, over fruit, with non-dairy yogurt, or plain! Sometimes you want some good, barbecue chicken, with some roasted corn on the cob and mashed potatoes. But sometimes, you find yourself in Swaziland, without a grill, and without barbecue sauce. This is a very simple recipe, but one that satisfied the craving I was feeling for a good piece of seared chicken slathered with a rich sauce with some depth to it. This sauce definitely has depth. In a nonstick pan, heat the oil. Put the balsamic vinegar into a shallow bowl and dip the chicken breasts in, covering them. Sprinkle salt, pepper, garlic powder, and dried oregano flakes to your own taste onto both sides and place the chicken into the hot pan. Cook over medium-high heat for about 5 minutes, then flip the chicken breasts. Add a little more balsamic vinegar to the pan while they are cooking and flip the chicken breasts to coat. Meanwhile, make the barbecue sauce; stir the ketchup, brown sugar, balsamic vinegar, lemon juice, and a little garlic powder together and bring to a simmer. Add your favorite kind of jam and continue to simmer until the sauce thickens and has the taste you want. Set aside until the chicken is ready. After the chicken has been cooked for about 8 - 9 minutes, remove from the pan to a plate or cutting board briefly. Use a sharp knife to cut the chicken breasts into thin slices, and return the slices to the pan. Continue to cook over medium-high heat for another few minutes, adding another few teaspoons of balsamic vinegar to the pan, until all pieces are completely cooked and the sides of each slice have been browned and seared. If desired, arrange in a baking dish, spread with the barbecue sauce, and bake in a 400 F oven for about 15 more minutes. Alternatively, place onto a serving dish, drizzle the barbecue sauce over them, and serve immediately with rice, mashed potatoes, quinoa, or any other sides of your choice. "Have you ever had sweet potato french fries?" my friend Joe asked me as we drove through Mbabane to his apartment to make dinner, winding up the hill on Somhlolo Road in the approaching dusk. I told him that I had not. "I think we need to make sweet potato french fries tonight," he said, grinning. Sweet potatoes as we know them in the U.S. are not really available here in Swaziland, with the most common varieties being white on the inside and much more starchy, like a regular potato, whereas our sweet potatoes resemble butternut squash. Joe has been working with an orphanage in Nhlangano, in the southern part of Swaziland, and the couple that runs it has a farm on their property where they grow our kind of sweet potatoes. And every time Joe goes down there, he told me, they give him some to take back with him. He showed me how to slice the potato into thick wedges, and then he mixed together olive oil and spices to coat them, and stuck them in the oven. Although they are baked, they sit in a good amount of olive oil, so they end up being more deep fried than anything. If you like sweet potatoes, you will absolutely love these fries. They bake up crispy on the outside and deliciously soft on the inside, with the coating a perfect complement to their flavor. Warning: it's quite likely that you will not be able to stop eating them and will wish you had made more once they're gone. The link to the original recipe can be found by clicking here. Preheat oven to 425 degrees. Spray a cookie sheet with raised edges lightly with cooking spray. Slice your sweet potatoes into french fry shape and size, about ¼” or a bit bigger. Cutting them larger will sometimes result in a big soggy mess, so stay small to get the best results. Make sure that they are all about the same size so they will cook evenly. Mix the spices into the olive oil and drizzle over the fries to coat them all and place them onto the cookie sheet. Be sure that they are not touching each other! Then pour any excess oil into the bottom of the cookie sheet. Place into the preheated oven and bake for 15 minutes without opening the oven door. Flip the fries over, and then return to the oven for another 15-20 minutes, being careful not to burn them. To find out more about how awesome Joe is or to thank him for the fabulousness that is this recipe, check out his facebook page. Oh yeah, these are as good as they look. Doused with coconut and infused with banana, the batter baked itself into a moist and delicious cake that I served to a group of non-celiacs. They were scraping the bottom of the plate for the last crumbs. See below for tips on making this dessert vegan! Mix the softened butter with the brown sugar and beat well, until the brown sugar is well-mixed in. Add the egg, mashed bananas, and vanilla. In a small bowl, mix together the gluten-free flours with the baking powder, baking soda, and salt. Add the flour mixture to the wet ingredients a little at a time. Stir in 1/2 cup of semi-sweet chocolate chips and 2/3 cup shredded coconut. Pour the batter into baking pan and smooth the top with a spatula. In another small bowl, combine shredded coconut, melted butter, and sugar, and sprinkle over the top of the batter. Spread about 1/4 cup of chocolate chips over the top. Warning: They will not last long. To make vegan chocolate chip bars: Substitute 1.5 tsp egg replacer + 2 tbsp. water for the egg and ensure that margarine is vegan (such as Earth Balance) and that the chocolate chips are also vegan. This is a soup that is simple to throw together, and is bursting with flavor. The nutritional yeast adds a slightly cheesy flavor to the soup, and the soy milk helps give it a creamier texture. It was hearty enough to be a meal on its own and was perfect to have on a chilly autumn night. Heat the oil in a pan over medium-high heat and add the onion and garlic. Saute until the onion has turned translucent and then add the potatoes. Add just enough broth (I used a vegan chicken-flavored one) to cover the potatoes, and add the oregano and parsley. Bring to a boil and cook for about 10 - 15 minutes, or until the potatoes are very tender and the broth is at least reduced by half. Using a potato masher, mash about half of the potatoes, leaving some to create a more chunky texture if desired. Add the nutritional yeast, soy creamer, and chives, and add salt and pepper to your own taste. Serve with a crusty bread or as a first course. Struck by inspiration while wandering the supermarket here, I picked up a package of rhubarb last week without feeling very sure of how I'd use it. My grandmother sometimes makes a delicious compote with rhubarb that is very simple to throw together, and that is what I thought of when I put it in my cart. But as it sat in my kitchen over the next few days, the wheels continued to turn as I formulated a plan for it. Thoughts of a rhubarb crisp passed through my mind, as did rhubarb jam and rhubarb pie. In the end, though, the thought of a coffee cake was what grabbed me, so I threw this together, humming as I mixed flours, chopped rhubarb and apples, and stirred it all together, taking in the delicious scents of cinnamon and vanilla that wafted out of the mixing bowl. I had a hard time waiting for this one to bake, and checked every few minutes in the hope that it would be done so I could try some. When (what seemed like ages later) it was finally done, I ate a slice warm from the oven and nearly melted. It held together beautifully, and the cinnamon streusel topping was the perfect complement to the tartness of the rhubarb, now softened into delicious sweetness with the chopped apple. It's a cake I would not hesitate to serve to a non-celiac. 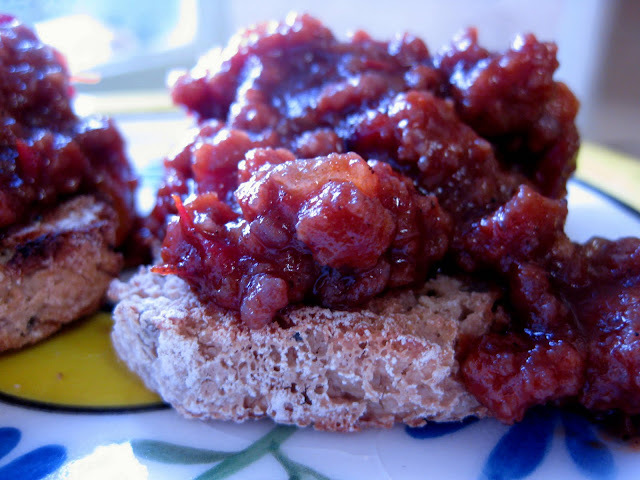 It tastes wonderful on its own, but for a bit of added flavor, serve with a dollop of Rhubarb Compote (see below), or with some of your favorite gluten-free, dairy-free ice cream (my favorite is So Creamy from Trader Joe's). In a small bowl or cup, place one cup of soy or other non-dairy milk. Add 2 tsp. lemon juice and let sit for 5 – 10 minutes. Cream the non-dairy buttery spread in a bowl and add the sugar, mixing very well until the mixture is crumbly. Add the egg and beat into the batter. In a separate bowl, mix together the buckwheat flour, tapioca starch, brown rice flour, baking soda, baking powder, salt, and 1 tsp. cinnamon. Alternate between adding flour and buttermilk to the butter/sugar mixture, mixing well after each addition. Add the chopped rhubarb and chopped apple and mix evenly. Place into a deep 8” x 8” pan. In another small bowl, combine the melted margarine (if you are using it), the brown sugar, and the cinnamon and mix into a crumbly mixture. Spread evenly over the top of the batter in the pan. Bake at 350 for 45 – 55 minutes or until the top is slightly browned and a toothpick inserted into the cake comes out clean. Serve topped with rhubarb compote, if desired, or plain. Place the chopped rhubarb and chopped apple into a small pan and add just enough water to cover them. Bring to a boil, then reduce to a simmer and allow the water to cook down until the rhubarb and apples have fallen apart and the mixture has become very thick. Add 3 -5 tbsp. brown sugar to your own taste. Remember when your mom would make sloppy joes when you were a kid? It was such a simple meal to make. Brown ground beef, add can of sloppy joe mix and plop onto a bun. An easy and tasty dish to throw together quickly on a weeknight. I can't explain my craving for a sloppy Joe this weekend, except unless it's coming from a bout of homesickness I've been experiencing lately. Of course, I can't find a can of Sloppy Joe mix here in Swaziland, so (without really knowing the ingredients that go into Sloppy Joes), I improvised this and ended up with something that went way beyond my expectations in terms of taste. It was so good! And while it didn't taste exactly like the Sloppy Joes of my youth, it wasn't too far off, and - if I do say so myself - was better. The sweetness mingled beautifully with the spicy and salty in the recipe. I didn't have any gluten-free buns, but I ate some on toasted bread, and also tried it with rice, and enjoyed it both ways. So I hope you enjoy this dish, which will send you back to a simpler time, yet will keep you rooted where you are with the complexity of its flavors. In a large pan, heat the oil and when it is hot, add the chopped onions and ground beef. Cook for 5 – 10 minutes, chopping into smaller pieces and stirring frequently. If desired, drain the excess oil and return to the pan. Add the garlic, peppadews, whole chili, and diced tomato and stir to mix. Reduce heat and cover to simmer the meat with the tomatoes until the sauce is ready. To make the sauce, combine the ketchup, brown sugar, balsamic vinegar, lemon juice, cayenne pepper, and chili powder into a small pan and bring to a boil and then simmer for a few more minutes until you are happy with the taste. Add 3 tablespoons of your favorite jam (I used cranberry/blueberry, but I think any would work fine – try another dark berry or apricot if you don’t have cranberry) and stir to mix. Return to a simmer for about 2 – 3 more minutes, or until you are happy with the taste. Add the sauce to the beef mixture and stir well. Simmer them together for about another 5 – 10 more minutes, adding salt and pepper to taste. 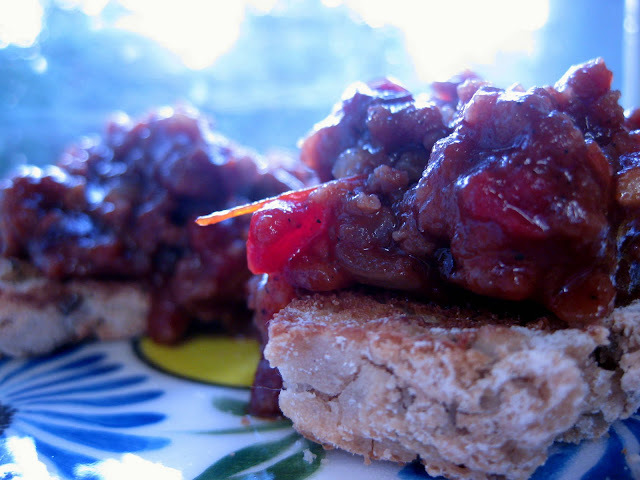 Spoon onto toasted bread or a gluten-free bun, or over rice or quinoa, and serve. That is roasted sou-sou. Never heard of a sou-sou before? Well, you are not alone. Neither had I.
I stopped and looked at it for a moment, and then wondered to myself how (and why) on earth this cactus-looking thing had found its way to my windowsill, especially since I live alone. When I tried to pick it up, the thorns attacked me, and so I left it alone on my windowsill, nursing my sore finger. For the next few weeks, I eyed it warily every time I came into the kitchen, the mystery of its appearance hovering over me as I cooked. Weeks later, my landlady asked me how I had enjoyed the sou-sou. Sou-sou? Dumbfounded, I stared back at her and mumbled something about "...cactus....window?" She laughed at me and explained that it was a sou-sou, or chayote (they go by several different names) and that they are growing on a tree in our backyard. My landlady had placed one in my window for me, assuming I would know what to do with it. Reaching into her own fridge, she pulled one out, peeled it, and cut me a slice to eat raw. It tasted like what I imagine a cross between a potato and an apple would taste like: crisp, fresh, and a bit starchy She told me to try roasting one sometime; that it was delicious roasted. So that's what I did this weekend at a dinner party I was co-hosting. We cut the sou-sou into thin slices and stuck them in the oven, where they got nice and crispy on the outside and remained tender on the inside. They made the perfect appetizer! After the sou-sou has been peeled and the pip removed, cut it into very thin slices. Place in a large mixing bowl and add the 1 - 2 tbsp. olive oil. Toss to coat all pieces, and then spread onto a baking sheet lined with foil. Bake for about 20 - 30 minutes, being sure to shift the pieces around to ensure even browning and crisping. Remove to a serving plate and serve as an appetizer or a side dish. Mmmm, French toast. It used to be my favorite thing to get at restaurants, and I have missed the delicious, crispy taste of it, served hot from the griddle. Often, gluten-free bread is much too dry or crumbly to have a truly good piece of French toast, but while I was in Johannesburg a while ago, I found a little health food store that sold some yeasted cinnamon raisin bread. Perfect! I brought it home with me and stuck it in the freezer for later use, and the other day, I decided it was time to turn it into something I had been missing for a long time: my favorite breakfast at dinner. My landlord smelled it wafting from my window and when I described for him what I was making, he said, "Oh, you're making Eggy Bread!" Why don't we all call it that?? It makes so much sense. In any case, no matter what you call it yourself, here is my recipe. Use non-stick cooking spray to coat a non-stick frying pan and heat over medium-high heat. Any other topping you enjoy!